Origin 2019b introduces a new set of data importing features collectively know as Data Connectors. We have previously blogged about some of our Web-based Data Connectors. But in this post, I will introduce our Origin File Data Connector. The Origin File Data Connector lets you connect to another Origin project file (OPJU or OPJ) and import data from it into your current project. It is a data-centric feature and will not pull graphs or analysis operations from an Origin project (though it can retrieve the end results of analysis operations if they are in a worksheet). 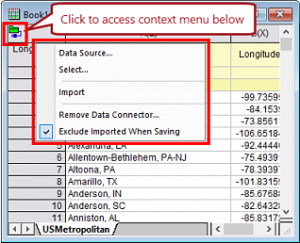 Additionally, in the interest of data integrity, all data is marked as ready only and if you delete any imported columns, they will be brought back the next time data is imported though the connector. The Origin File Data Connector can be accessed from the Data menu from which you can choose two connection methods: Connect to File for local or network-based Origin project files or Connect to Web for Origin projects hosted either on the internet or a company intranet. In this blog post, I will use the later method- Connect to Web to illustrate the feature. For this post, I will be using an Origin project file hosted in the internet. Depending on your geographic region there are two different URLs for the hosted project file (they are both the same file). Check it out! Observe that the first URL is a shared link from DropBox. 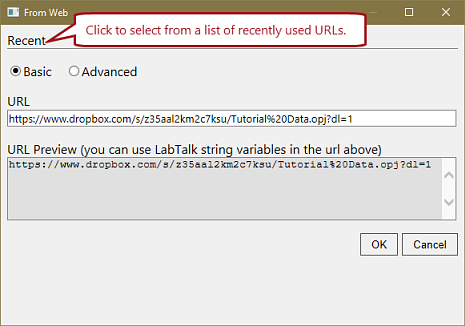 If you yourself have an Origin project file on DropBox, you can create a shared link and get the link text to use for the Data Connector URL. They only thing you need to do is to modify the last part of the URL from ?dl=0 to ?dl=1 or the link won’t work. Here are the basic steps for connecting to and importing data from one of those remote project files. Create a new, blank workbook. From the Data menu, select Connect to Web: Origin File. 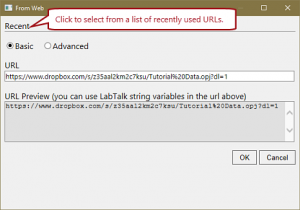 In the From Web dialog (see illustration below), paste either of the URLs above (they are also available from the Recent men at the top of the dialog). There may be a brief delay as the project is temporarily transferred across the web. Next, the Data Connector Browser dialog (see illustration below) appears and displays a hierarchical view of worksheet and matrix sheets in the project. Once a sheet has been selected, clicking the OK button will import the data into the active worksheet in the current project. You can even add another sheet of data from the remote project file by right-clicking on current sheet tab and selecting Add Sheet. Then click on the Data Connector icon (see illustration below) and Choose Select… to select a different sheet to import. The Data Connector Browser dialog. By default, the imported data is not saved when the current project is saved. You can change this behavior by clicking on the Data Connector icon in the top left of the workbook (see illustration above). 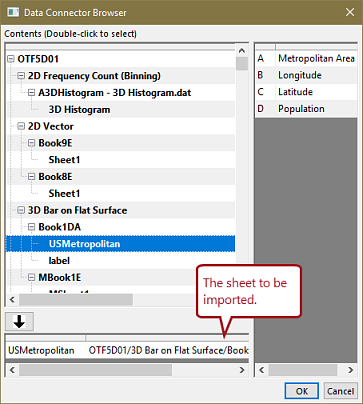 That icon also allows for changing the data source (the remote project file), the selection of data (which worksheet), and also re-importing the data for the current sheet or all sheets in the current book. As previously mentioned the imported data is read-only in the interest of preserving data integrity. As well, while you can delete columns, they will be brought back on next import. Finally, it is worth noting that you can have as many worksheets as you want pointing to the remote project file either in the same book or in different book. I hope you have the opportunity to give this new feature a try and start incorporating it into your daily Origin workflow.